Updated September 15, 5:20 p.m. -- Carnival reports that the ports of Charleston and Galveston are open, and confirms that Carnival Ecstasy and Pride will depart on their next cruises as planned on Sunday. 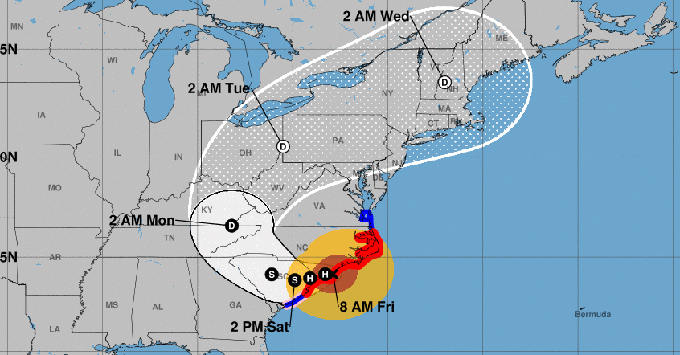 Florence has been downgraded to a tropical storm, and is moving westward over eastern South Carolina, bringing rain and flooding. (Updated 9:12 a.m. EDT) -- Several cruise ships have been forced to either reroute or delay their next sailing to avoid the impact from Hurricane Florence, a massive hurricane zeroing in on the U.S. East Coast with maximum sustained wind speeds of 90 miles per hour. The Category 1 storm (downgraded from a Category 4 major hurricane) is now touching down in North Carolina, near the South Carolina border, with life-threatening swells, high winds, heavy rains and tornadoes. A State of Emergency has been declared for South Carolina, North Carolina, Georgia, Maryland and Virgina. No cruise ships are sailing from Virginia, this year. Norwegian Escape, which departed from New York City on September 9, called at Florida's Port Canaveral (Orlando) and Great Stirrup Cay, the line's private island in the Bahamasin lieu of three days in Bermuda's King's Wharf. Nassau was originally one of the replacement ports, but Norwegian axed the call to ensure the ship would arrive back in New York City, on time. A spokesperson for the line said: "Due to recent developments with Hurricane Florence in the Eastern Atlantic, we have modified Norwegian Escape's itinerary to avoid the storm. To ensure an on-time arrival in New York City on September 16, Norwegian Escape did not call in Nassau on September 13. Instead, she began her return voyage to New York. We are closely monitoring the storm and will provide additional updates as they become available." Norwegian Dawn, which departed from Boston on September 7, will sail a Canada and New England itinerary in lieu of visiting King's Wharf. Its new ports of call are Halifax and Sydney, Nova Scotia; Saint John, New Brunswick; and Bar Harbor, Maine. The ship is expected to arrive in Boston on September 14, as planned. Oceania's Sirena, which is nearing the end of its repositioning cruise from Europe to Miami, is bypassing its visit to Bermuda's St. George Island and instead stopping in Nassau. It is expected to arrive in its winter home of Miami as scheduled on September 16. Oceania's Insignia headed north and sailed to Saint John in New Bruswick, followed by two days in Portland, Maine. The ship will overnight in New York City before its scheduled disembarkation on September 13. Royal Caribbean's Grandeur of the Seas, departed from Baltimore on September 8, and sailed a Bahamas itinerary, spending two days in Nassau instead of King's Wharf. Passengers were compensated for the changes, according to Cruise Critic member Tee & Chilli on the Royal Caribbean forums. Grandeur of the Seas, originally due to return to Baltimore on September 13, will be held in Florida's Port Canaveral (Orlando) until the storm passes and it is safe to return. On another Royal Caribbean thread, Cruise Critic member wardbigpapa posted: "Just received an email from RCCL stating that Grandeur should be back in Baltimore NO later than Sunday." A spokesperson for Royal Caribbean confirmed the new ETA, adding that the line's chief meteorologist, James Van Fleet, is providing passengers onboard with daily weather updates." Also on the thread, member Chrome Diva shared a letter from Royal Caribbean to its travel partners, detailing compensation for passengers on the next cruise, which subsequently has been shortened. Passengers who choose to sail on the next cruise -- originally a nine-night Canada & New England itinerary scheduled to depart on September 13, now slated to depart September 17 -- will receive a refundable onboard credit to their SeaPass account for the cruise days missed (based on the cruise fare paid while excluding taxes and fees), and any amount not spent during the cruise would be posted to cruisers' credit cards on file. In addition, they will receive a future cruise credit for the cruise fare value of the days missed; pre-purchased shore excursions will be credited, while shore excursions booked for any of the ports that have been rearranged, will be automatically rescheduled." Those who choose not to sail the shortened itinerary will receive a 100-percent future cruise credit, based on the cruise fare paid, and any pre-purchased items will be automatically refunded. The letter added: "While it is still our intent to return to Baltimore by Sunday, the storm has slowed down and may impact our arrival date and time into the Port of Baltimore"
Carnival Pride, which left Baltimore on September 9, has replaced its Bermuda itinerary with a Bahamas and Caribbean itinerary, stopping in Grand Turk and Half Moon Cay, a private island in the Bahamas operated by sister brand Holland America Line and shared with Carnival. It had planned to call in at Freeport, The Bahamas, but that has now been canceled to to avoid the storm and ensure a speedy return to Baltimore on Sunday (September 16). The line's senior cruise director and ambassador, John Heald, posted today on his Facebook page that Carnival Pride is still on schedule to return to Baltimore as planned on Sunday. Carnival Ecstasy Although no changes have been made to the ship's current itinerary, its return to Charleston, South Carolina, on Sunday is still subject to be delayed. As of how, however, Heald said it is still on schedule to arrive on Sunday as planned. Carnival Horizon, originally due in Bermuda this Saturday, also has been rerouted. The ship is currently on an eight-day sailing that departed from New York on September 5 -- the ship has canceled its September 9 call in San Juan and instead visited Amber Cove; it's to arrive in New York, as scheduled, on September 13. Tropical Storm Isaac also has affected cruise ships in the Caribbean, while over in the Pacific, two cruise ship itineraries were modified as a result of former Tropical Storm Olivia.